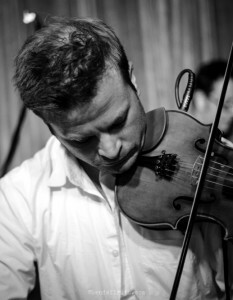 Robert Anderson (violin) has been teaching, performing, recording, and composing in the Los Angeles area since 2000. As co-founder and music director of String Project Los Angeles, established in 2006, Robert enjoys teaching the art of improvisation and encouraging musical creativity in young string players. A Yamaha artist and clinician, Robert has traveled throughout the country to educate teachers and students, and has served on the faculty at Christian Howes’s Creative String Workshop in Columbus, OH. In addition to a busy private studio, Robert currently brings his unique teaching style, creativity, and contemporary repertoire as director of the middle school string ensembles at SMASH (Santa Monica Alternative School House), and high school string ensemble at New Roads School (Santa Monica, CA). 2012-13 is his 5th year as coach for the Elemental Strings youth orchestra program. Robert has been a faculty member of the Popular Music department of the Thornton School of Music at the University of Southern California since the department’s inception in the fall of 2008. His chamber and orchestral arrangements and compositions have been performed by youth orchestras in Southern California, Arizona, Nevada, South Carolina, at the National Cello Institute, the Idyllwild Summer Music Festival, and at Violafest Los Angeles. In 2012 Robert became composer in residence for Elemental Strings.